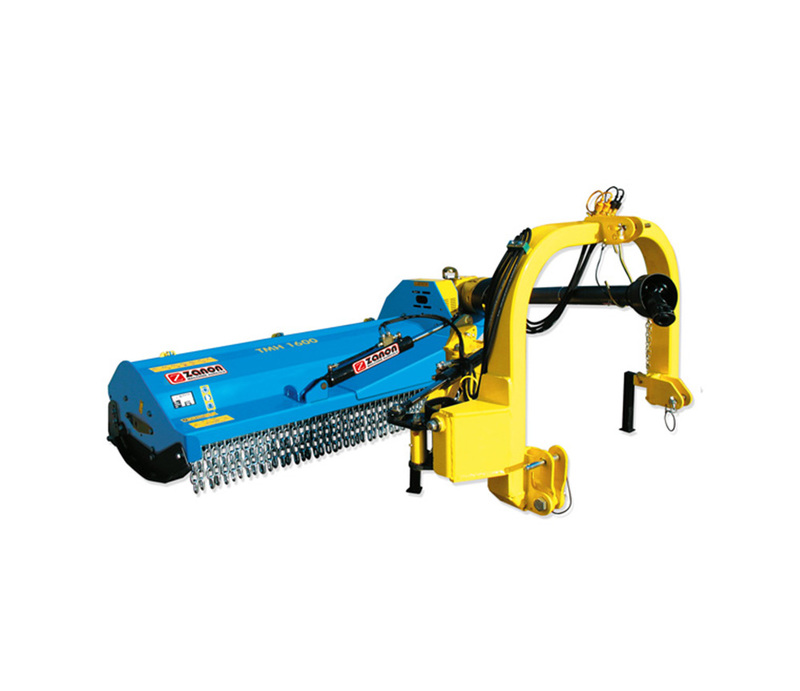 The TSP flail mower is ideal for mulching hay, twigs and more besides. 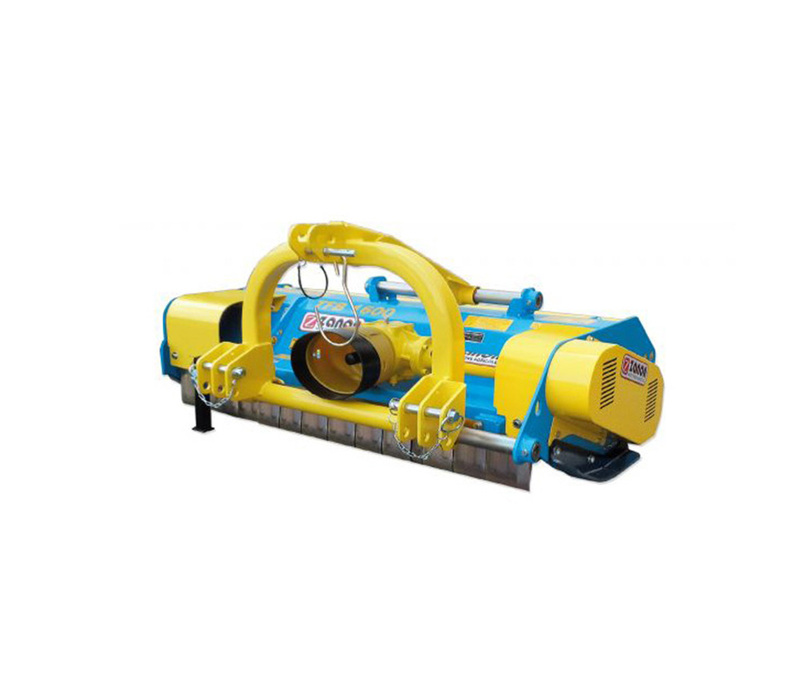 The roller is placed close to the rotor, so it is automatically cleaned by the rotating hammers and the cut material is distributed over the top of the roller. It boasts a robust steel frame and it is fitted with an electronically balanced rotor fully enclosed with helical configuration and self-aligning bearings. The belt transmission is driven by an oil bath bevel gearbox with a freewheel. The rotor can be fitted with Y blades or hammers to suit the job in hand. Hammers or blades, counter-blades, height adjustable mounting slides, EU standard safety devices, levelling roller with rapid height adjustment, adjustable belt tensioner, mechanical lateral side shift, gearbox with a bidirectional freewheel and internal frame support. The TMU heavy duty mulcher is ideal for mulching twigs, maize, grass, hay, tobacco, artichokes, beet, cotton, and more besides. It boasts a robust steel frame and an electronically balanced rotor mounted on fully enclosed, self-aligning bearings. The belt transmission is driven by an oil bath bevel gearbox with a freewheel. The rotor can be fitted with Y blades or hammers to suit the job in hand. Hammers or blades; counter-blades; height adjustable mounting slides; CE standard safety devices; self-cleaning levelling roller with rapid height adjustment; adjustable belt tensioner; mechanical lateral movement; oil bath gearbox with freewheel; over-size frame with inspection cover; a reinforced rotor ; self-levelling twig rakes; double PTO guard. PTO shaft; hydraulic movement system; spreading wings; rear wheel kit; inter-row head. The TMB reversible mulcher is designed for front or rear mounting on medium to high power tractors (50 to 110 HP). 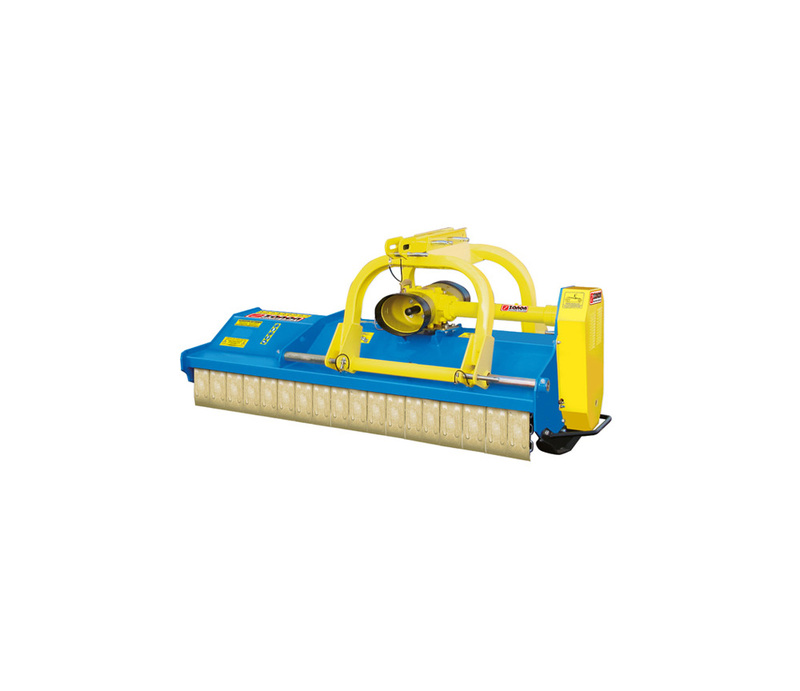 It is ideal for mulching grass, maize, hay, pruning waste (in olive groves, orchards, etc. ), brushwood and more besides. It boasts a robust steel frame and an electronically balanced rotor mounted on fully enclosed, self-aligning bearings. The belt transmission is driven by an oil bath bevel gearbox with a freewheel. The implement can function in both directions of PTO rotation. The rotor can be fitted with Y blades or hammers to suit the job in hand. N.B. : Specify PTO speed: 540 rpm or 1000 rpm. The TRP reversible mulcher is designed for front or rear mounting on medium to hight power tractors (55 to 110 HP). 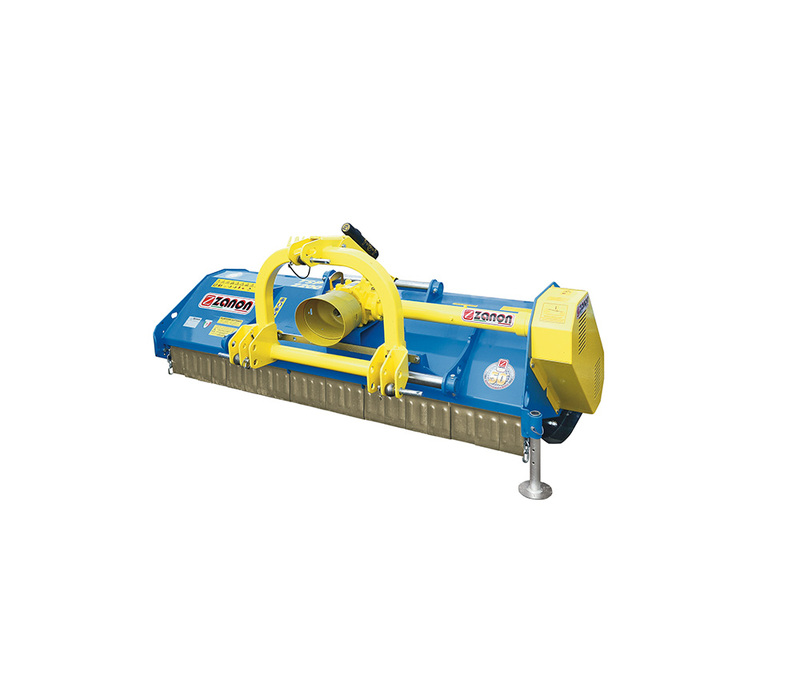 It is ideal for mulching grass, maize, hay, pruning waste (in olive groves, orchards, etc. ), brushwood and more besides. It boasts a robust steel frame and an electronically balanced rotor mounted on fully enclosed, self-aligning bearings. The belt transmission is driven by an oil bath bevel gearbox with a freewheel. The implement can function in both directions of PTO rotation. The rotor can be fitted with Y blades or hammers to suit the job in hand. N.B. : Specify PTO speed: 540 rpm or 1000 rpm. Hammers or blades; counter-blades; height adjustable mounting slides; CE standard safety devices; self-cleaning levelling roller with rapid height adjustment; adjustable belt tensioner; mechanical lateral movement; oil bath gearbox with bi-directional freewheel; self-levelling twig rakes; protective chains; double PTO guard. PTO shaft; hydraulic lateral movement kit; front and rear wheel kit. Fixed, hard metal blades; counter-blades; height-adjustable skids; Ø 520 mm forestry rotor; EU standard safety devices; double chain curtains; gearbox with freewheel (1″3/4 coupling); hydraulic hood opening; three point hitch (cat. II-III); double PTO guard; double sided shaft drive; PTO shaft. 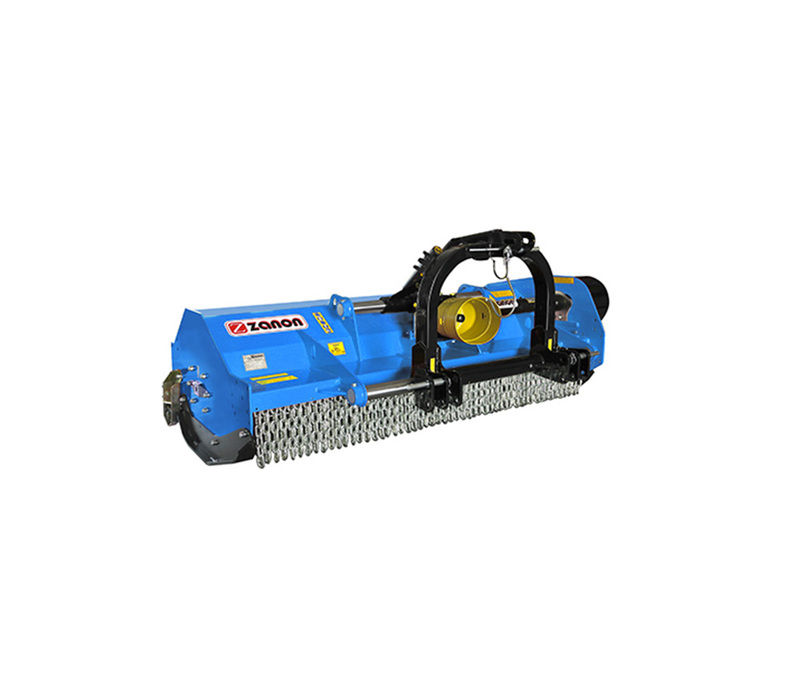 The TN/DT SPECIAL mulcher is designed to shred branches, vegetation and logs of up to 30 cm in diameter. It features a robust steel frame and a large, electronically balanced rotor with fixed, hard metal blades, mounted on fully encased, self-aligning bearings. Fixed, hard metal blades; counter-blades; height-adjustable skids; Ø 520 mm forestry rotor; EU standard safety devices; double chain curtains; gearbox with a freewheel (1″3/4 coupling); hydraulic hood opening; three-point hitch (cat. II-III); double PTO guard; double sided shaft drive; PTO shaft. Thanks to an extensive range of adjustment, the TMH verge mulcher can be used on all kinds of terrain. 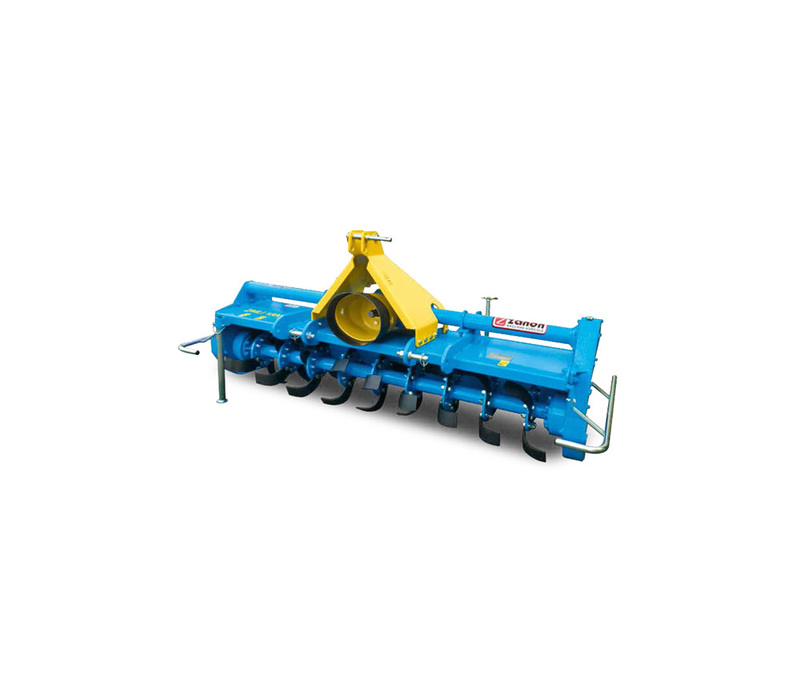 It is ideal for mulching grass and twigs in ditches, on verges, embankments, and in vineyards and orchards in general. 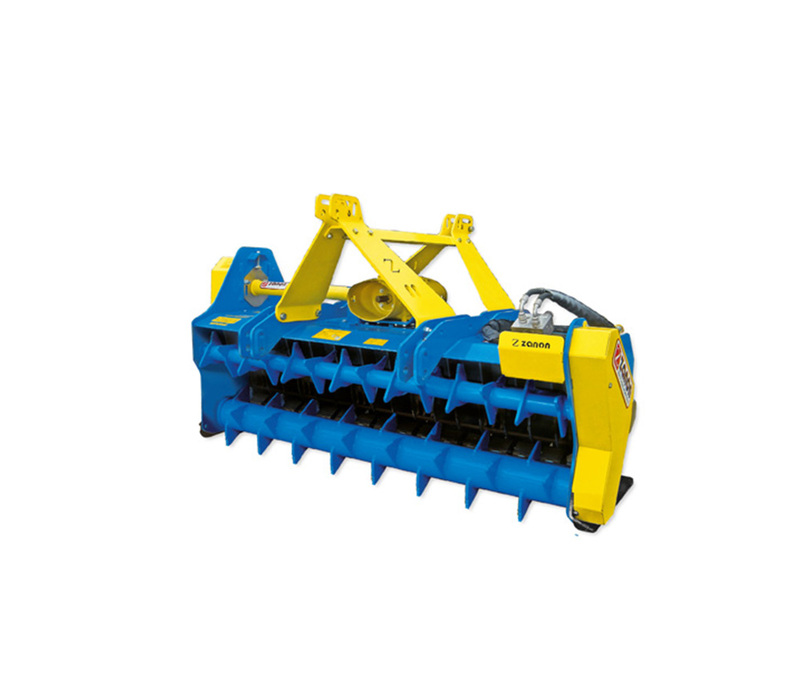 The TMC mulcher can be used centrally aligned or laterally displaced and functions at any angle from +90° to -55° (fig. 1). Lateral movement varies according to the model. Hammers or blades; counter-blades; height-adjustable mounting slides; European standard safety devices; height-adjustable self-cleaning, levelling roller; adjustable belt tensioner; oil bath external gearbox with freewheel; inspection cover; hydraulic system with safety valves for vertical rotation and hydraulic lateral movement; Rilsan coated, aligned PTO shaft. Low body height (only 50cm) makes the TFB mulcher ideal for general purpose shrub and pruning waste mulching in low foliage stem crops, orchards, olive groves and vineyards. 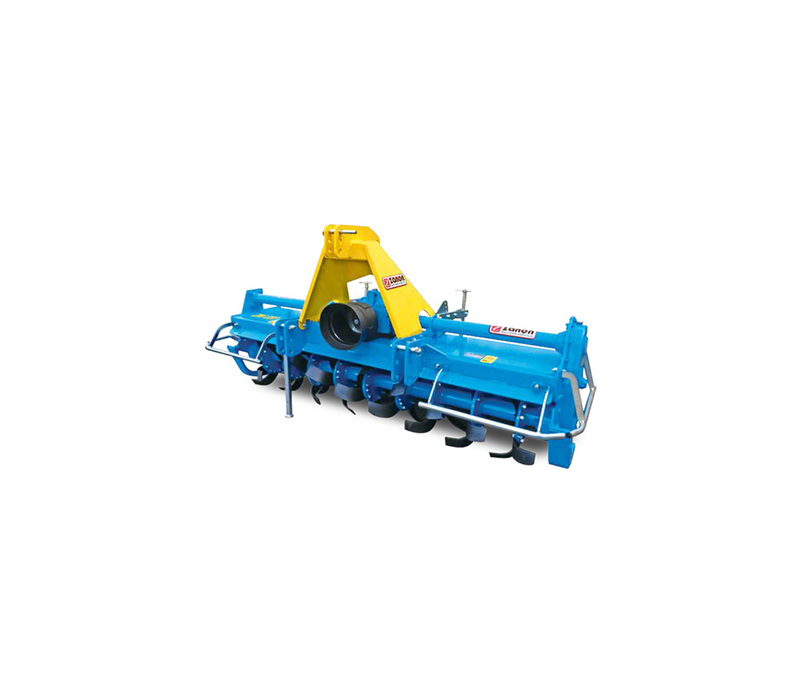 It is ideal for mulching grass, maize, hay, pruning waste (in olive groves, orchards, etc. ), brushwood and more besides. It boasts a robust steel frame and an electronically balanced rotor mounted on fully enclosed with helical configuration, self-aligning bearings. The belt transmission is driven by an oil bath bevel gearbox with a freewheel. The rotor can be fitted only with hammers. Hammers; counter-blades; height adjustable mounting slides; EU standard safety devices; levelling roller with rapid height adjustment; adjustable belt tensioner; mechanical lateral movement; gearbox with bi-directional freewheel; double PTO guard; inspection cover. Universal 3 points of 1 cat, transmission Central 4 speed, Side transmission to gears in a bath of oil, Nr. 6 Curved zappettes for the flange, Sleighs regulation depth, chest adjustable back levelling, safety protections, taken of strength: 540 turns/min. Electronic pruning shear, with double blade opening, registrable by the trigger, equipped with a kit DRIVE 600 .S LITHIUM battery with an incorporated control unit, mounted in a harness. Reversible battery to be operated by right handed or left handed. The DRIVE 600.S LITHIUM Battery can work up to 2 days (depending on usage end each cut consumption). DRIVE 500 S battery charging time: 5 hours. Sound level less than or equal to 60DB(A). Vibration level less or equal to 2,5m/s2. 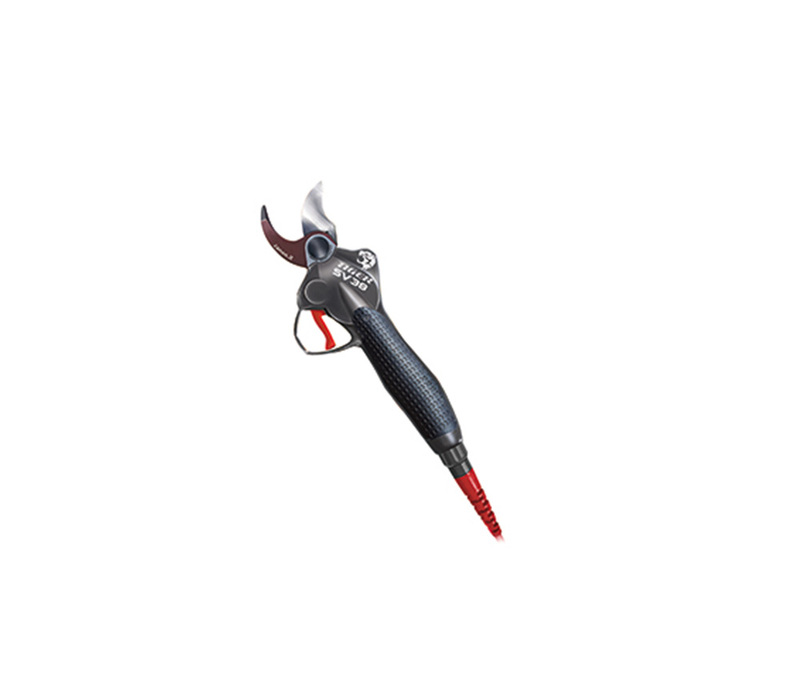 Electronic pruning shear, with double blade opening, registrable by the trigger, equipped with a 5,8 AH LITHIUM battery with the incorporated control unit, mounted in a harness. Special battery charger. Reversible battery to be operated by right handed or left handed. Reinforced connection lead. 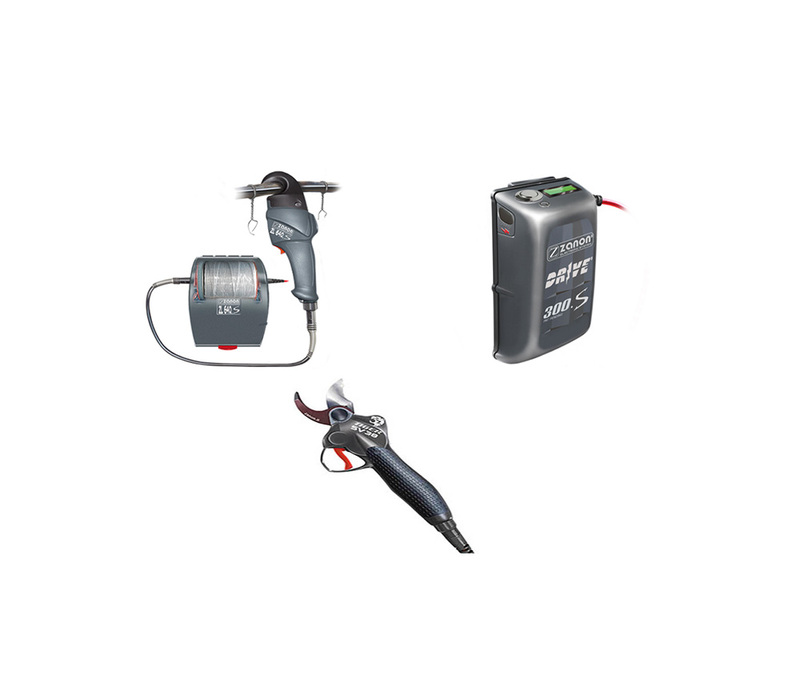 The 5,8 AH Li-ion Battery can work up to 2 days (depending on usage end each cut consumption). 5,8 LITHIUM battery charging time: 5 hours. Sound levels less than or equal to 60DB(A). Vibration level less or equal to 2,5m/s2. 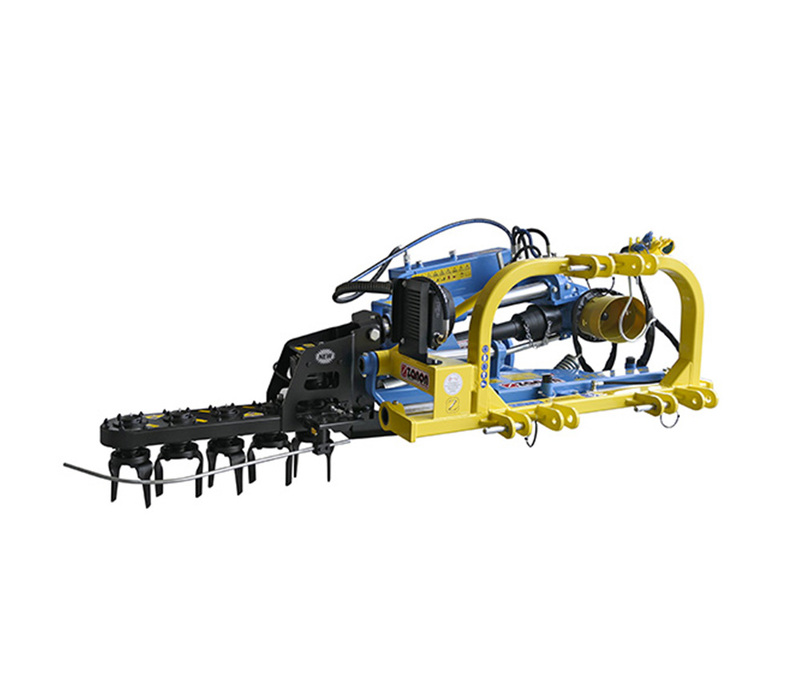 With interchangeable header assembly and its harrow/rotary tiller two-in-one design, the ITC in-row cultivator was designed for versatility. 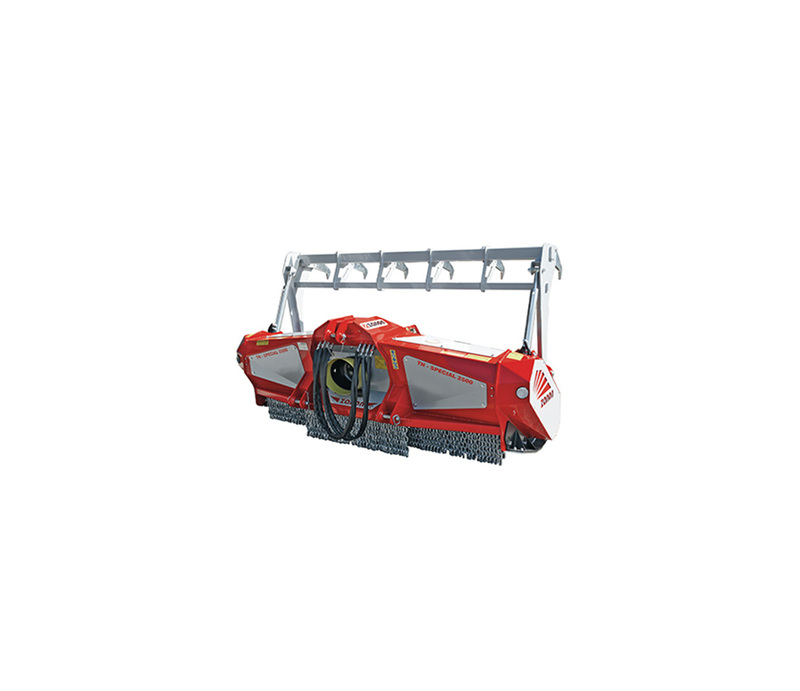 It is suitable for orchards and vineyards as well as wide-angle branch planting systems. 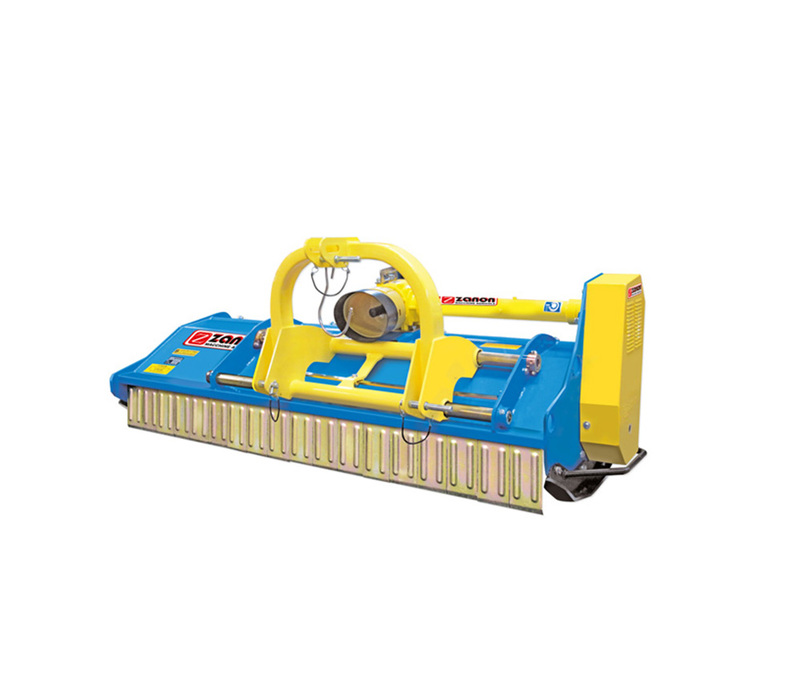 ITC is a reliable, robust and versatile speciality machine and its uses are wide-ranging. Thanks to the ultra-sensitive feeler, the working unit changes position with extremely quick and precise motions; this makes it possible for the tractor to move at higher speeds and ensures excellent results in any type of soil, including rocky or weed-infested soil. Mount with double attachment for maximum off-centre and side-shifting action; adjustable header inclination for setting of the hydraulic work angle; adjustable spring to compensate for soil hardness; safety lock valve to prevent the header from coming out when in the at-rest position; suction oil filter in the tank; lever with steel wire for manual emergency return. 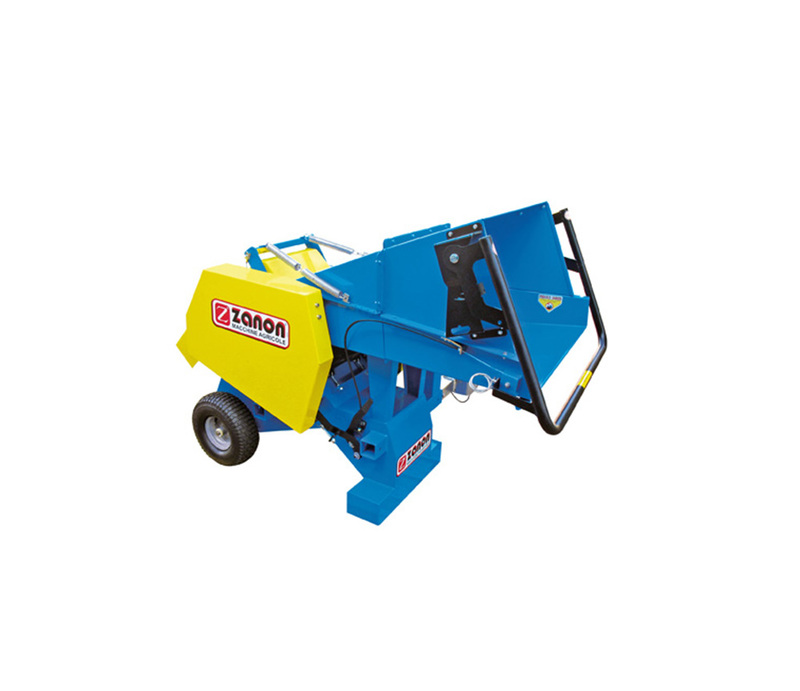 The shredder BIO 140–T is suitable for grinding corn, tobacco, sugar cane, palm groves, fibrous and pruning bushes in general. The cutting unit is formed by a cylindrical frame on which are fixed, by bolts, 8 blades, hardened and adjustable, with the counter-adjustable according to the requirements of cut. 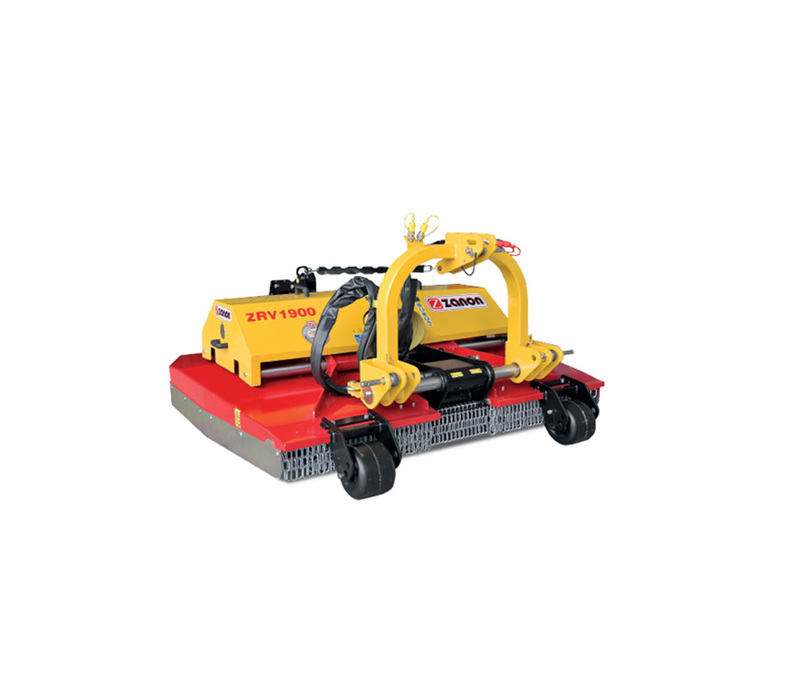 The ZRV mower features an innovative cutting system with hydraulic width adjustment that allows the machine to function at different mowing widths. 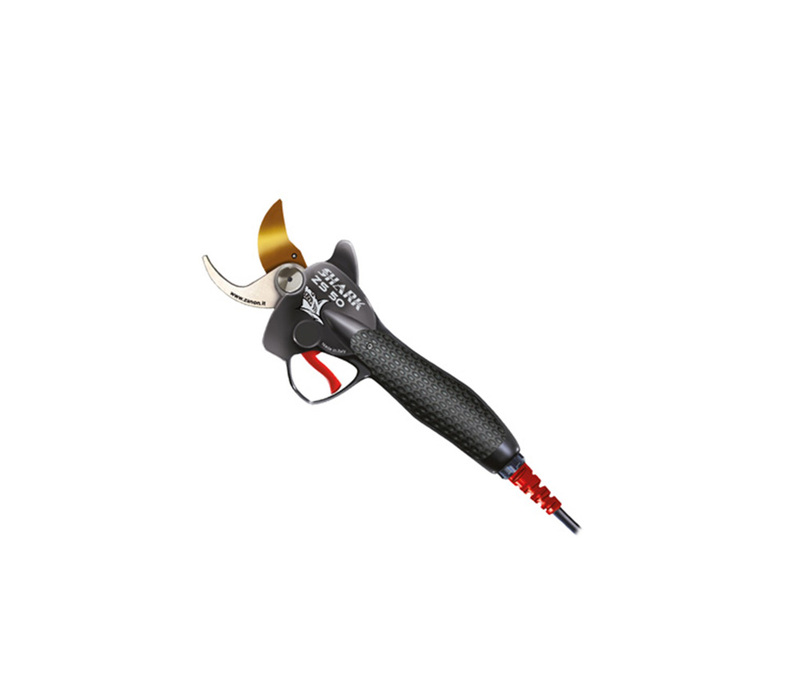 The RZE is ideal for cutting grass and shredding twigs and pruning waste in general, especially in vineyards and orchards. It is available in different versions to suit requirements. Width-adjustable cutters; hydraulic mowing width adjustment system; height adjustable front wheels and rear roller; two-sided discharge; PTO shaft with clutch and freewheel; safety chains.